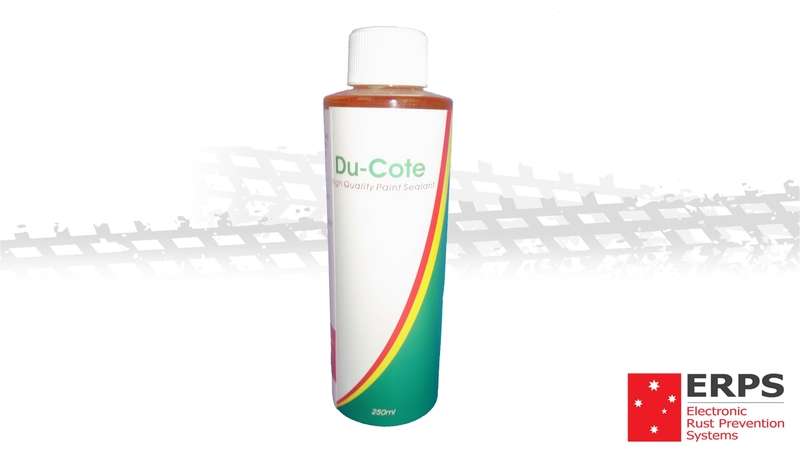 Du-Cote is a high quality paint sealant which gives the paintwork a longer life and shine. In addition to sprays and lubricants, there are a number of liquid products that can help in the war against corrosion. Paint sealants are designed to stop paintwork degradation and provide an additional layer between oxygen and moisture and your vehicle. These solutions are DIY friendly and will also help keep your paintwork in top condition! Du-Cote is a paint protection program, designed to protect the new vehicle’s paintwork against fading, oxidation, corrosion, staining, pitting, petrol, oil & detergents. As paint ages it becomes more porous and allows atmospheric moisture through to the bare metal underneath. These conditions are conducive to rust forming and the paint losing its luster and protective qualities. When buying a new vehicle, paint protection is an integral part of the aftermarket package which typically costs around $500. For a fraction of the cost you can achieve the same results by applying Du-Cote yourself. It’s as easy as polishing the car. In the past few years a number of vehicle manufacturers have been using acrylic (water based) paints and it is therefore advisable to protect your new vehicle’s paint. By applying Du-Cote to your existing vehicle you can increase its resale value by rejuvenating the Duco and extending the life of the painted surfaces. Great product, I recommend it to everyone. We’ve used it on both our 4WDs, one of which is regularly on the beach, and it works a treat. The cars always look clean and are definitely easier to clean. It’s like a lazy person’s polish.